Painting of Virginia Hall by Jeffrey W. Bass. Oil on Canvas, 2006. Donated by Richard J. Guggenhime. Present location: CIA Museum, Langley, VA. 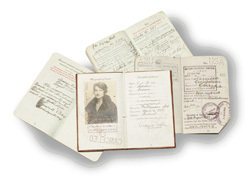 GUEST BLOG / By CIA Museum--Her life reads like a WWII spy novel. From overcoming the loss of her leg to working clandestinely behind enemy lines, she’s a true American hero. Who is this brave woman? Some knew her as "Marie Monin," "Germaine," "Diane," "Camille," and even "Nicolas," but in real life, she was Virginia Hill of Baltimore Maryland. When France fell under the Nazi boot in June 1940, Great Britain stood alone against the enemy. Fearing a similar fate for his country, Winston Churchill created the Special Operations Executive (SOE), an organization specializing in irregular warfare against German forces in occupied countries. SOE’s early recruits for espionage operations were from a variety of people from all classes, pre-war occupations, and countries—including a 35-year-old American woman by the name of Virginia Hall from Baltimore, Maryland. Hall had seen the Nazi devastation in France firsthand and was eager to do her part to defeat fascism. She underwent SOE’s rigorous preparation, remarkably, not because she was a woman, but because her left leg was made of wood, the result of a below-the-knee amputation necessitated by a pre-war hunting accident. By this time, the Americans had also created a paramilitary organization, the Office of Strategic Services (OSS). Hall transferred to the OSS and asked to return to occupied France. She hardly needed training in clandestine work behind enemy lines, and the OSS promptly granted her request, sending her to south-central France. Because her artificial leg kept her from parachuting in, she landed in Brittany from a British PT boat. As “Diane,” she eluded the Gestapo and contacted the Resistance. Often disguised as a milkmaid, she mapped drop zones for supplies and commandos from England, found safe houses, and linked up with a Jedburgh team after the Allies landed at Normandy. Hall helped train three battalions of Resistance forces to wage guerrilla warfare against German forces and kept up a stream of valuable reporting until Allied troops overtook her small band. 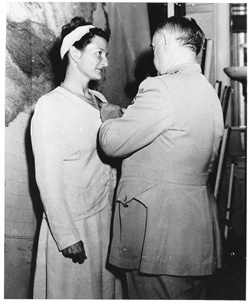 For her efforts in France, OSS chief General Donovan, left, personally awarded Virginia Hall a Distinguished Service Cross—the only one awarded to a civilian woman during World War II. The medal is currently on display in the CIA Museum’s OSS Gallery. Hall later worked for the CIA, serving in many capacities as one of CIA’s first female operations officers. 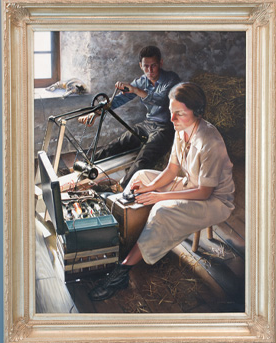 The painting portrays Hall in the early morning hours, radioing London from an old barn near Le Chambon sur Lignon to request supplies and personnel. Power for her radio was provided by a discarded bicycle rigged to turn an electric generator, the clever invention of one of her captains, Edmund Lebrat. Using codes such as “Les marguerites fleuriront ce soir” (the daisies will bloom tonight), Hall was apprised of what airdrops to expect from London and when.